პანჩენ ლამა (ტიბ. པན་ཆེན་བླ་མ, ვაილი: Pan-chen Bla-ma პანჩენ ლამა, ჩინ. 班禅喇嘛/班禅额尔德尼) არის ტიბეტური ბუდიზმის გელუგპას სექტის (სექტა, რომელიც XVI ს-დან ჩინეთის სუვერენიტეტის გამოცხადებამდე, 1951, მართავდა დასავლეთ ტიბეტს)დალაი-ლამას შემდეგ უმაღლესი ლამა. მიჩნეულია, რომ ტულკუს რეინკარნაციული ხაზით, პანჩენ ლამები ამიტაბჰას ინკარნაციები არიან. სახელი, მნიშვნელობა — „დიდი მეცნიერი“, სანსკრიტულ პანდიტასა (მეცნიერი) და ტიბეტურ ჩენპოს (დიდი) შეკუმშვაა. პანჩენ ლამები ტრადიციისამებრ ცხოვრობდნენ შიგაძის ტაშილჰუნპოს მონასტერში. ↑ Das, Sarat Chandra. Contributions on the Religion and History of Tibet (1970), p. 82. Manjushri Publishing House, New Delhi. First published in the Journal of the Asiatic Society of Bengal, Vol. LI (1882). 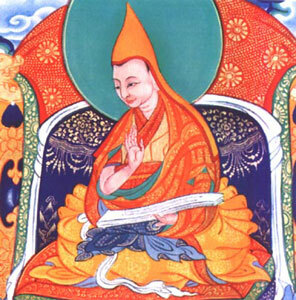 ↑ 3.0 3.1 3.2 The title Panchen Lama was conferred posthumously on the first two Panchen Lamas. ↑ 4.0 4.1 The Tibetan government-in-exile under the 14th Dalai Lama recognizes Gedhun Choekyi Nyima as the 11th Panchen Lama; the government of the People's Republic of China recognizes Qoigyijabu as the 11th Panchen Lama. The Dharma King, The Dharma King is a novel, written by Bradford Stroh, about one man's quest to find the reincarnated Panchen Lama. ეს გვერდი ბოლოს დარედაქტირდა: 12:14, 17 მარტი 2013.